Food for Thought has stood in the heart of London's Convent Garden for nearly 30 years maintaining a reputation for innovative and delicious vegetarian food within a quirky and friendly, family-run atmosphere. The basic formula has not changed in those three decades, but the role of vegetarianism has. More and more people are turning to vegetarian food for health reasons. Gone are the days of traditional pulses and meat substitutes: vegetarian eating offers a deliciously healthy way to enjoy food. 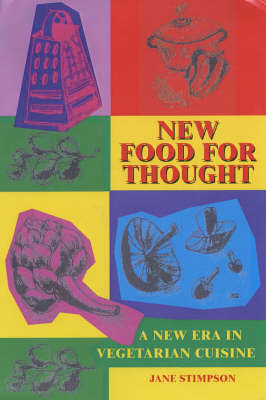 First published in 1994, New Food For Thought offered over 150 of the most popular recipes served in the restaurant. This edition is fully revised and updated to reflect the slight changes in the restaurant's menus. Every single chapter includes brand new dishes; the existing recipes have been simplified to require fewer ingredients and there is a whole new chapter of Food For Thought's popular Specials, offering mouthwatering recipes for occasion dining. From quick stir fries to gourmet meals, sumptuous cakes and desserts to vegan and wheat-free dishes, this book draws on vegetarian cooking from all over the globe using fresh ingredients all readily available from your local supermarket. It proves, yet again, that vegetarian cooking is an appetising healthier option for converts and carnivores alike.